Someone decided that the S. hydrida ‘Fastigiata' just was not good enough, not cutting the mustard, not making the grade, failing to perform or was not reaching its potential. For what ever reason, they worked their magic and came up with the Sorbus hybrida 'Gibbsii'. It has a more compact habit which in non gardening terminology means that it is not that tall nor does it spread very much making it very suitable for smaller gardens. Just to clarify, it is not that small making it suitable for window boxes (we do get some odd questions so just pre-empting them). Expect white flowers in Spring, from the tree that is, not from the local florist as this is a tree selling website not some psychic fortune telling site. These turn into green fruits which then turn into a coral red and then remain on the tree for quite some time. 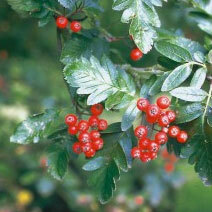 The Sorbus Gibbsii is also considered hardy so the "usual" UK weather should not present it with a problem. Compared to the Fastigiata it has larger bunches of fruits making it even more appealing for the birds and those wanting to make jellies etc with them. The bark is smooth and grey and a little grooved at the base. The Gibbsii originated in England in 1924. This was the year Harold Abrahams and Eric Liddell attended the Paris Olympics which was the story that Chariots of fire was based on. So if you see your tree bending in the wind, it still maybe caught up in the Olympic spirit and may actually be "dipping for the finish line" in traditional finishing style. The Gibbsii is so good that it has received the RHS Award of Garden Merit. 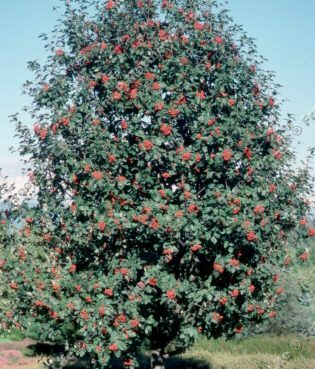 As it has so many great qualities, the Gibbsii Mountain Ash is particularly suitable for public space planting because it is attractive to look at, is particularly long lived and its upright shape makes it a good option for roadside planting. Its Autumn colours make the Gibbsii even more interesting maybe not enough to pull up a chair and watch the whole colour range for three months but worthy of getting your attention. 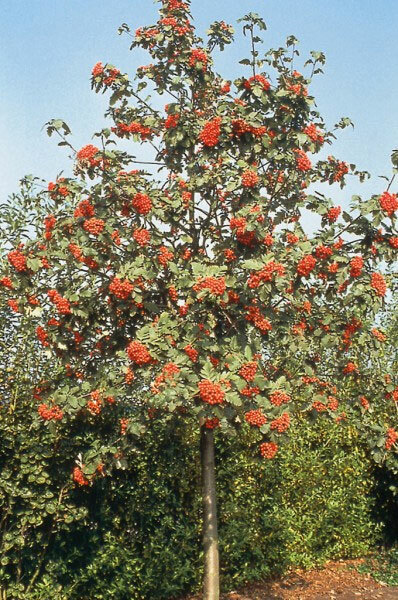 Mountain Ash Gibbsii is not like Michael Jacksons children in that it needs high maintenance but will benefit from the occasional thinning to promote new growth. As with many other Sorbus, the Gibbsii is suitable for coastal planting and will tolerate wet conditions but not standing water. If you have the local water board measuring your garden up to be an additional reservoir for the area, you may have a drainage issue and therefore not suitable for planting this tree. The Gibssi is considered a small height tree (this information does not come from the small tree averse taller trees but a guy with a tape measure) so expect a height of around 4 metres after ten years. It could go on to grow more but local conditions and weather play a large part in this. Manual pruning can of course keep the tree to the exact height you want, well, until it grows a bit more again but you know what we mean. If your garden has clay soil then the Gibbsii Mountain Ash will tolerate this and still perform well. If the local pottery club restocks its clay bin from your borders then you may want to consider adding some organic material to the spot where you are planting just to help it along a little. You can also plant in acid or neutral soil. You can plant the Gibbsii in full sun or partial shade in an exposed or sheltered environment. We know this sounds like anywhere but nuclear submarines, bottom of coal mines etc, you may struggle to get the results you expected. This tree is supplied at a height of between 1.5 and 2.0 metres in a 12 litre container.